Home Games Console PC & Laptop Gigabyte Saber 17: A poorly controlled gaming PC? 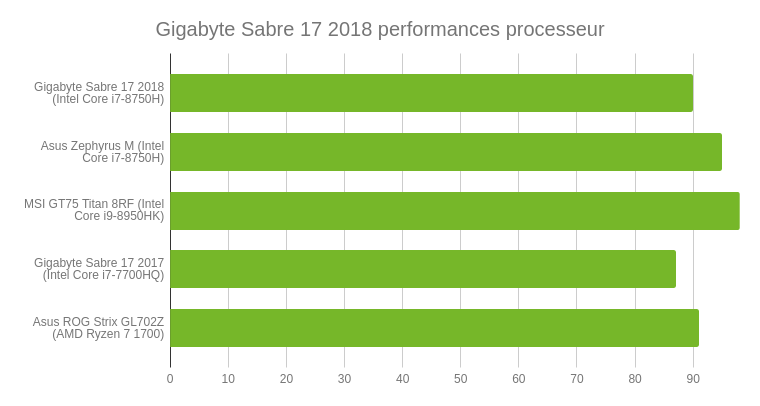 Gigabyte Saber 17: A poorly controlled gaming PC? Fallen by his screen! 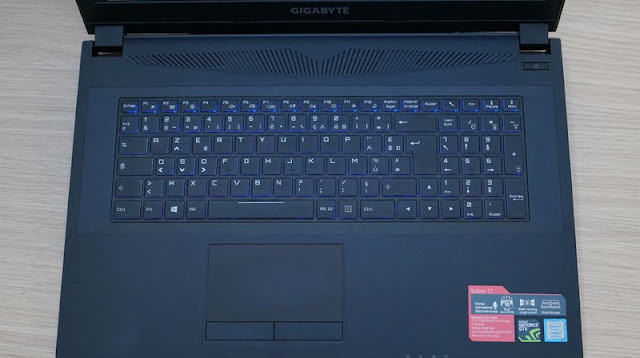 The Gigabyte Saber 17 (2018). The Saber 17 returns to our columns with an updated processor, but also a new screen. For his gaming PC, Gigabyte keeps the same formula. Gigabyte's previous Saber 17 is not the best gaming PC in our labs. Nevertheless, he had his primary mission, that is to offer players a powerful and effective equipment at stake. For this new version, Gigabyte did not upset its formula, but still made small changes. Thus, the PC hosts an Intel Core 8th generation, but also - and more surprisingly - a new slab in TN technology, instead of the IPS panel of the previous model. Changes that change the experience anyway, and not necessarily good. The Gigabyte Saber 17 from 2018 does not reinvent the wheel and offers exactly the same chassis as the previous version. So we find a plastic construction. Plastic that bends under the fingers and deserved a better care. Visually speaking, the Gigabyte Saber 17 wants to be very sober with its black dress and angular lines. Only a few small details like ostentatious air grilles and a backlit keyboard testify to a PC made for the game. The keyboard and trackpad do not change either compared to the previous model. The Saber benefits from a good-quality RGB backlit chiclet keyboard with a long stroke and good resistance under the fingers. The trackpad is however not good quality and the user will quickly plug a mouse for the game to do without. The Gigabyte Saber 17 offers an extremely complete and appreciable connectivity. It has two USB 3.1 Type-A ports, a USB 3.1 Type-C port, a USB 2.0 port, two mini DisplayPort ports (1.2 and 1.3), an HDMI 1.4 port, a port Ethernet and an SD card reader, in addition to two 3.5mm mini-jack ports (a microphone input and a headphone output). On the heating side, the results of this new Saber are logically similar to those of the previous one, since they use the same chassis. During our usual protocol ( Metro Last Light benchmarkfor one hour), the PC has reached the temperature of 52 degrees above the keyboard. An honorable score, counterbalanced nevertheless by a hazardous design. Indeed, the heater spreads at the palm when the fingers are placed on the keys ZQSD - frequently used for the game -, the user then having to deal with a plastic reaching 36 degrees under the hand. In addition, the hot breath, measured here at 54° C, is cleared on the right side, exactly where is the hand of a right-handed user holding his mouse. A rather embarrassing mistake. Side noise, the PC releases 46 decibels, which makes it audible, but not deafening. In terms of consumption in contrast, the Saber 17 is exemplary, since it consumes 130 watts in play, 20 W on the desk and nothing standby. 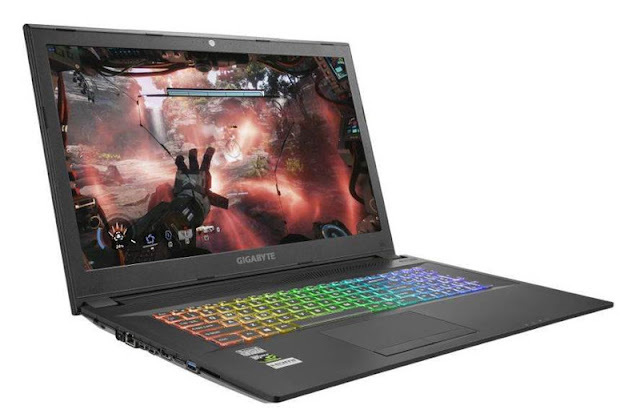 The Gigabyte Saber 17 is equipped with a 17.3-inch TN display with a definition of 1920 x 1080 pixels and a refresh rate of 120 Hz. A slab change from the previous model equipped with an IPS screen. If the display becomes more responsive, however, it loses in other areas, such as the management of color temperature and especially viewing angles, much less wide with a TN panel. The ratio screen / facade is relatively low, since it is 72.02%. Once under the lens of our probe, the screen of Saber 17 reveals results as amazing as disappointing. The contrast is relatively good, at 1390: 1, but the average Delta E reaches 8.7, well beyond the threshold of 3 under which the eye can no longer distinguish any color drift. A non-respect of the colors which is found in our chart and which concerns especially the dark hues. This is easily observed with the naked eye, the blacks appearing light gray. 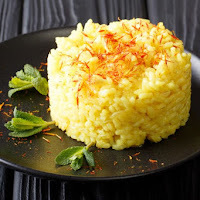 But the most disappointing result is that of the temperature, which amounts to 14,460 K, a result far too far from the standard of 6,500 K. The consequence is obvious, the screen wearing colors very cold, giving the impression of being constantly covered with a visible blue veil. From left to right: gamma curve, temperature, Delta E.
Nevertheless, the screen reveals its strengths in terms of responsiveness. 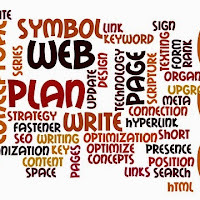 We have indeed measured a remanence of 4 ms; a very low result that can be explained by the choice of the slab, TN technology often allows a better responsiveness. However, it is unfortunate that Gigabyte, by focusing on responsiveness for his new Saber, has not managed to calibrate his slab. This is all the more unfortunate with a simple probe and third-party software, we have corrected the colors in ten minutes, making the screen much more comfortable to use. The Saber 17 is equipped with an Intel Core i7-8750H processor supported by 16 GB of RAM. With such a processor, the user can be quiet about the power of his PC. During our test test protocol (photo compression, video, audio), the Saber 17 has reached the index of 90 on our new scoreboard. It is thus placed in the middle of the current gaming PCs equipped with an 8th generation Intel processor and will be able to run software very greedy computing power. Wolfenstein 2 : 52 fps. The Gigabyte is placed in the middle of the market, tied with the Dell Inspiron G5, for example. 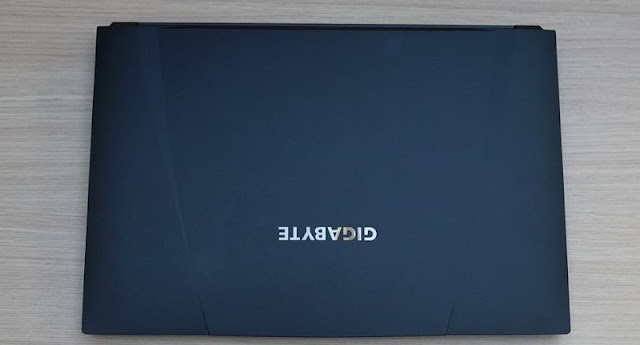 Weighing 2.9 kg and having a 17.3-inch screen, the Saber 17 is more portable than portable computer, especially if we take into account its external power rather massive. Regarding autonomy, the PC surprises nevertheless. During our usual protocol (Netflix under Chrome, backlighting off, earphones connected and brightness at 200 cd / m²), it turned off after 4 hours and 11 minutes. An honorable score for a computer dedicated to games, designed to never get too far from an electrical outlet. The previous model Saber 17 did not shine in the sound part, especially because of its execrable speakers, but he made up with his headphone output. On this new model, the speakers sadly offer the same listening experience and the headphone output is no longer save the furniture. The sound reproduction of the speakers is particularly bad. The frequency response concentrates exclusively around 1 kHz: results in a very pronounced telephone effect, resonances and whistles very unpleasant, as if the sound came directly from a headphone plugged next to the computer. The maximum power is also ridiculous. The voices are very often inaudible, even aggressive. To make matters worse, the placement and distance between these speakers and the screen do not provide a very natural listening experience (as if the sound came from the surface on which the computer is sitting and not from the computer in himself). 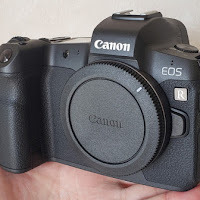 In short, it is a disaster that deserves a single star in our notation, but that rises painfully to two thanks to a usable headphone jack, even if not powerful. 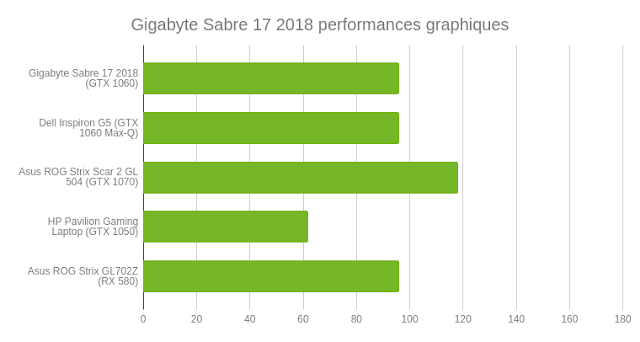 With his Saber 17, Gigabyte wants to offer a powerful gaming PC and succeeds, but unfortunately does not control all other aspects of his computer. The change of slab could have been interesting if the calibration was at the rendezvous, but serves the product. The chassis, identical, logically keeps the same defects as before, including an awkward management of heat dissipation. The coup de grace comes with the speakers, unusable as is. A copy to review for Gigabyte.